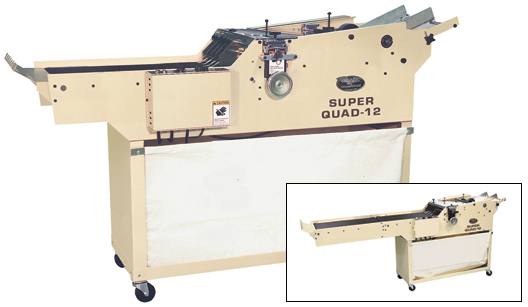 The Super Quad-12 Business Card Slitter was introduced in 1999 and was originally configured with a friction feeder and 1/16″ gutter-cut blades. The Super Quad-12 is designed to produce standard and odd size, foldover and bleed business cards. The Super Quad-12 can run up to 30,000 four-up business card strips per hour. Over the years, several options have been introduced that have dramatically increased the utility and productivity of the machine. An extended delivery conveyor option doubles the delivery capacity of the Super Quad-12. High production plants have found that the extended delivery conveyor reduces operator workload and increases productivity, especially when using the scissor-cut cassette and fanout attachment. Customers who purchase the Super Quad-12 to produce a single product, often substitute the standard wide delivery conveyor for an optional 45″ long, full length partitioned delivery. Special width gutter-cut blades are available for the Super Quad-12 slitter. While the standard 1/16″ wide gutter-cut blade is, by far, the most popular style, some products require a wider gutter. The flexibility of the Super Quad-12 design allows gutter widths to be manufactured to meet specific customer requirements. The quick-change blade cassettes, used on the Super Quad-12, have been a huge success in the industry. Blade cassettes not only allow customers to switch between different job formats easily, they also assure consistent product quality. This is an important issue. Using pre-configured blade cassettes each time a specific job format is run on the slitter, the finished product is consistent because the blades are never moved between jobs. The standard Super Quad-12 is an incredible machine. Optional equipment allows capabilities to be added to meet customer requirements. If you are looking for a proven production solution that will allow you to efficiently produce standard and odd size, foldover and bleed business cards using gutter-cut blades, the Super Quad-12 is the only machine available to get the job done.